Sun., Aug. 5, 2018, 4:45 a.m. The polls and pundits have U.S. Rep. Cathy McMorris Rodgers in a competitive race with Democrat Lisa Brown to retain her seat in Congress. On Tuesday, Eastern Washington will find out if those forecasts are accurate. McMorris Rodgers has taken notice, running a spate of TV, radio and mail ads that depict Brown, a longtime state legislator, as soft on crime and big on tax increases. Brown has returned a few salvos of her own, casting McMorris Rodgers as an out-of-touch Washington insider who has spent 14 years in the capital serving the party’s interests before those of the region’s farmers, manufacturers and recipients of government-administered health care. The congresswoman, faced with two challengers to her political right, Dave Saulibio and Jered Bonneau, who have fully embraced President Donald Trump and the constitutionalist-leaning wing of the Republican Party, has reached out to a perhaps unlikely political ally in state Rep. Matt Shea. The Republican Spokane Valley legislator, who has campaigned on what he calls a “Freedom Agenda,” has offered his endorsement of McMorris Rodgers in the race based on her work “in the pardon of the Hammonds and other veterans issues,” according to a post on his website. The Hammonds referenced are Dwight and Steven Hammond, a father-and-son pair of Eastern Oregon ranchers who were sentenced to five years in federal prison for setting fire to federal lands. The court decision eventually led to the armed occupation of nearby Malheur National Wildlife Refuge, which drew Shea’s involvement. “I reached out to Matt Shea to talk about some of the others that were in the race,” McMorris Rodgers said in an interview last week. Shea did not return a phone call seeking comment on his endorsement of McMorris Rodgers. The endorsement is a shift from his position in 2016, when he supported Trump but wrote that the congresswoman’s support of an energy bill was “antithetical to Constitutional Conservatism” and said she “endorsed against and/or opposed every good conservative in this area.” Shea made no recommendation for the congressional race in 2016, just as he had in 2014. Brown said in an interview Friday she hadn’t studied the case, but believed the issue wasn’t a concern for voters. “If the issue is, the connection between Rep. Shea and McMorris Rodgers and going to the president on behalf of a particular case, that doesn’t seem like a priority issue for Eastern Washington right now,” Brown said. The concept draws on a long line of legislative initiatives that date back to when McMorris Rodgers and Brown both were serving in Olympia. McMorris Rodgers hasn’t dismissed the idea completely, noting that she pushed for a change in state government that would have given each Washington county a state senator – a concept determined to be unconstitutional when the U.S. Supreme Court ruled in 1964 that each state’s legislative districts should have roughly the same population. Brown said she opposed Shea’s plan for Eastern Washington to split from Washington, noting that McMorris Rodgers’ ads have tried to tie her to interests in Seattle. Shea’s endorsement could give McMorris Rodgers a boost among conservatives who’ve seen the merit in Brown’s argument that the congresswoman has been in Congress for too long. In 2016, Republican candidate Tom Horne used a similar argument to propel him to 11 percent of the primary vote. Rob Chase, Spokane County’s Republican treasurer who’s allied with Shea on several issues including the creation of a state bank, said he believed Shea’s endorsement might help McMorris Rodgers have a stronger showing in the primary. Spokane County Sheriff Ozzie Knezovich said he couldn’t speak for the McMorris Rodgers campaign and that he believes the congresswoman remains “most definitely” his choice to represent Eastern Washington in Congress, citing concerns over Brown’s record on criminal justice issues. But Knezovich, who has a long-running feud with Shea and some of his adherents, said he would never consider asking for an endorsement from the Spokane Valley Republican. Saulibio, who’s running as a member of the “Trump Populist Party” that he created, is hoping to seize some of those votes in an effort to push McMorris Rodgers further toward the president. “I want to send a message to Cathy, mostly,” he said. “Why don’t you support Trump 100 percent? The general feeling among those in Brown’s camp is that McMorris Rodgers already is too close to the president. Their signs and chants outside a fundraiser in downtown Spokane last week tied the long-term congressional candidate to Trump. Despite a few high-profile votes on immigration issues and condemnations of Trump’s retaliatory tariffs, Nate Silver’s statistical analysis website FiveThirtyEight reports that the congresswoman has voted with Trump 98.2 percent of the time. “I hear it all,” McMorris Rodgers said. The congresswoman points out that her support within the party reaches beyond Shea, and that she believes her campaign’s message about Brown’s record voting in favor of tax increases will resonate with voters. “It’s difficult to predict, because of voter turnout, and obviously it’s summer and the election isn’t on everyone’s minds,” McMorris Rodgers said of the primary. Brown echoed that uncertainty about what the polls will show Tuesday. But she said she believed the congresswoman’s ads including ones that label her dangerous are serving to deflect from what should be the campaign issues. 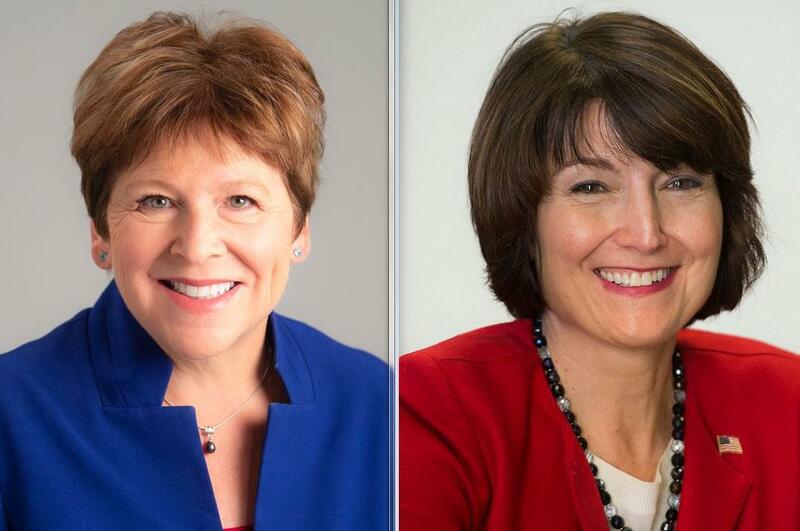 Brown’s most recent TV ads say she’s only “dangerous” because McMorris Rodgers is concerned about losing her seat. “The ads are obviously designed to attack me, but also to distract from the things people are really focused on right now, which is why isn’t Congress getting anything done?” Brown said. Saulibio said he believed Brown also was being hemmed in by the concerns of the Democratic Party, which he didn’t think would serve her well in an election in a historically red corner of the state. Bonneau did not return messages requesting comment for this story. Another candidate, Kari Olavi Ilonummi, is running as a Republican despite not living in the district. Primary ballots must be postmarked by Tuesday or dropped off at an official ballot drop box by 8 p.m. Tuesday in order to be counted. Published: Aug. 5, 2018, 4:45 a.m.